All-sided swelling of a young shoot, c. one cm long and 3 mm thick. 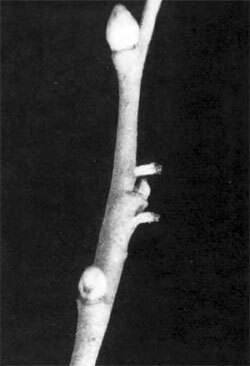 The gall often lies at the base of a one-year old twig, often several in a row. In the pith an elongated cell with a single yellow larva. The larva hibernates in the mine; in spring it pupates just under the epidermis, recognisable as a circular yellow spot. With question marks, Buhr adds: caprea, purpurea, repens. The larva is similar to the one of R. saliciperda, but the apical part of the spatula is lozenge-shaped with in front two sharp teeth, separated by an acute indentation. Between the prothoric horns the pupa bears a pair of strong teeth (Kieffer). 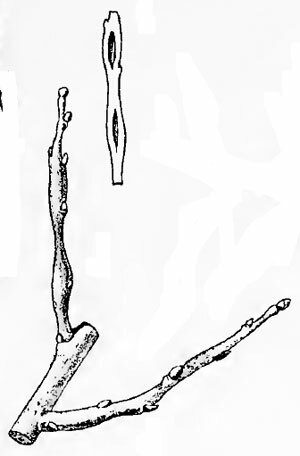 Cecidomyia, Rhabdophaga, karschi; Rabdophaga oculiperda (Rübsaamen, 1921). Between about 1980 and 1990, R. karschi has incorrectly been considered a junior synonym of R. salicis. Barnes (1951a), Buhr (1965a), Cogolludo (1921a), Gagné (2010a), Gagné & Jaschhof (2014a), Houard (1908a), Kieffer (1891a, 1892a), Redfern & Shirley (2011a), Roskam & Carbonnelle (2015a), Skuhravá (2009), Skuhravá, Skuhravý, Blasco-Zumeta & Pujade-Villar (2006a), Skuhravá, Skuhravý, Dauphin & Coutin (2005a), Skuhravá, Skuhravý & Meyer (2014a), Skuhravá, Skuhravý & Neacsu (1972a), Skuhravá, Skuhravý, Skrzypczyńska & Szadziewski (2008a), Stelter (1978a, 1980a).